State highway crews began work today on fixing the gaping hole in Cold Run Valley Road in Berkeley Springs, West Virginia. Excavation equipment was brought in this week, and the work crews began digging out the road and culvert pipe that were ripped apart by the rains and flooding that hit the area Sunday June 3. 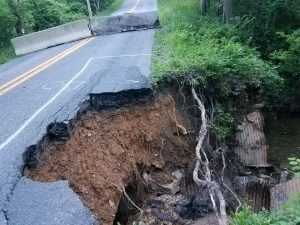 Cold Run Valley Road has been closed since June 3. Once the damaged part of the roadway is cleared, two cranes will be brought in to put in place the new box culverts. West Virginia Division of Highways engineer Lee Thorne said that he’s aiming to have Cold Run Valley Road opened by the end of next week – or Friday July 20. Thorne said that a recent dry spell gave work crews an opening to begin work today. Thorne said box culverts last longer than pipes – and have a greater carrying capacity.